After the slipknot, learning how to make a crocheted chain is the first technique you will need to master. Nearly every project you'll ever crochet, will be made using a chain. When you first learn how to do a chain, make sure you make a few metres to get into the swing and find your natural tension - this might sound like a great deal but actually chains grow really quickly. 1. Twist the hook under and over the yarn – yarn round hook (yrh). Pull the yarn through the loop on hook and drop it off to make first chain. 2. Continue to make chains in this way. Each chain is made up of three strands, with the V shape visible on the ‘right side’. When counting, don’t count the loop on the hook. A pattern will always state how many chains are required to begin your project. However it will be written as ch, the abbreviation of chain. For instance, a pattern may ask you to begin a project by making 40ch. When you start to make actual crochet fabric, the pattern will usually instruct you to skip a number of chains and begin working into one further away from the hook. For example, when the pattern tells you to work into the '3rd ch from hook', you would count downwards from the hook and miss the first two and work the stitch required into the next one. But you won't always be asked to work directly into the chain, instead you could be instructed to work a chain ring. 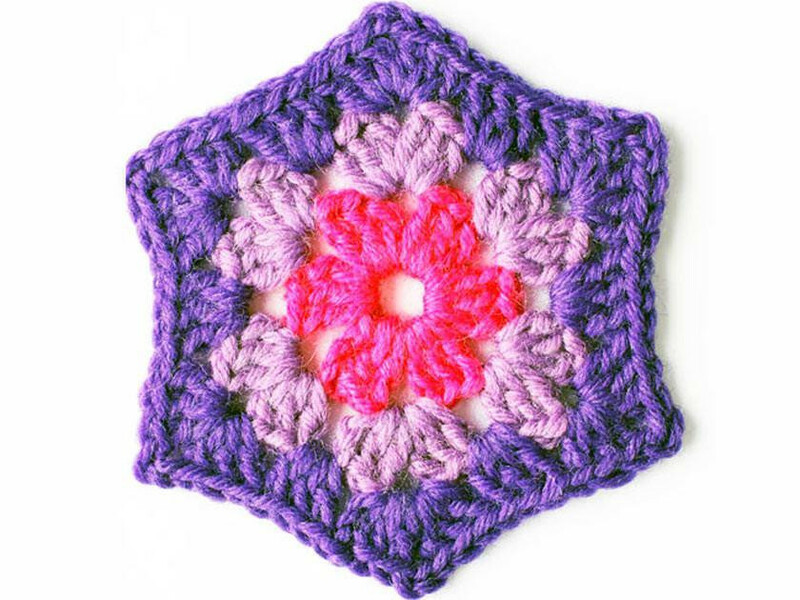 Chain rings are used to start a circular piece of crochet, such as granny squares. Your pattern will tell you how many chains to make (most often between 3 and 6) and then instruct you to make a slip stitch (slst) in the 1st ch that you made (this will be your slipknot from the very beginning). To do the slst, insert your hook into the right chain from front to back, under two strands of yarn in your 'v' shaped stitch (see above), yrh and draw through to join. This will complete turning your straight chains into a circle which you can work into as your progress further into your project.